A new series of microwave signal generators offers high-frequency, wide-bandwidth performance and other benefits, and is well-equipped to handle 5G applications and more. Higher frequencies are more important than ever, as 5G communications, satellite communications (satcom), and radar applications all plan to utilize a wide range of frequencies that extends into millimeter-wave (mmWave) bands. That means test-and-measurement companies must keep up by providing equipment that can generate mmWave signals with very wide bandwidths. These companies must also support other components like complex modulation schemes and multiple-antenna techniques. To satisfy these demands, Keysight Technologies recently launched the VXG Series of microwave signal generators. The series consists of the M9384B VXG benchtop instrument (see figure) and the M9383B VXG-m modular PXIe version. The VXG microwave signal generators cover a frequency range of 1 MHz to 44 GHz. They also provide modulation bandwidths as high as 2 GHz. 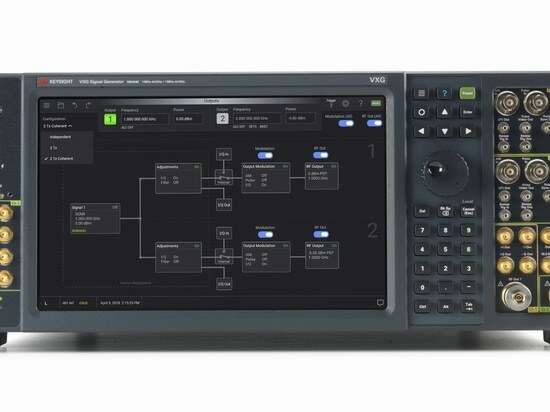 The VXG instruments contain dual, phase-coherent, and fully calibrated signal generators, making them well-suited for the test requirements of advanced 5G designs. The fully calibrated dual channels allow for quick execution of receiver blocker and interference testing without changing device setups. And the phase coherency means that relative phase, time, and amplitude offsets can be controlled between the two channels. High output power is another significant attribute of the VXG Series—the instruments can deliver signals at 28 and 39 GHz with maximum power levels of +24 dBm. Such performance makes them ideal for 5G over-the-air (OTA) testing. 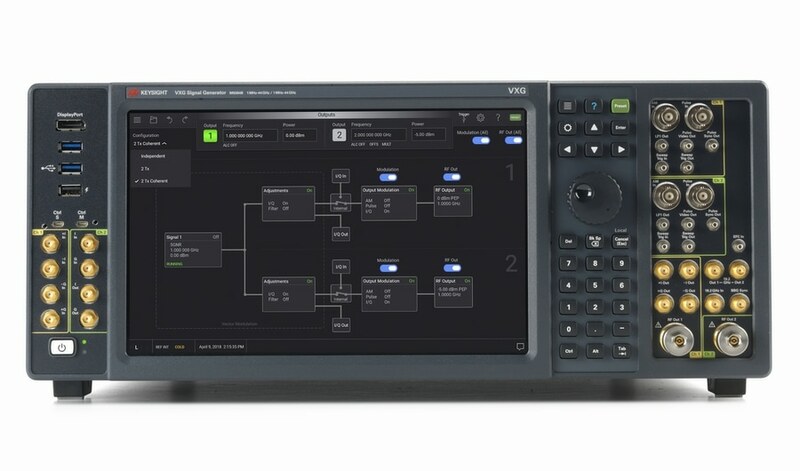 In addition to high output power levels, Keysight emphasizes that the VXG generators achieve low error-vector-magnitude (EVM) and minimal adjacent-channel-power-ratio (ACPR) performance. Specifically, an EVM of 1.0% is achieved for 28- and 39-GHz signals with a 100-MHz bandwidth and an amplitude of +10 dBm. For 28- and 39-GHz signals with a 400-MHz bandwidth and an amplitude of +8 dBm, the EVM is 1.3% and 1.5%, respectively. Furthermore, the ACPR is −50 dBc in the case of a 28-GHz signal with a 100-MHz bandwidth and an amplitude of 0 dBm. Another key performance metric of the VXG Series is phase noise, which Keysight boasts is “the world’s lowest for a mmWave vector signal generator (VSG).” At 10 GHz with a 10-kHz offset, the phase noise is −126 dBc/Hz. 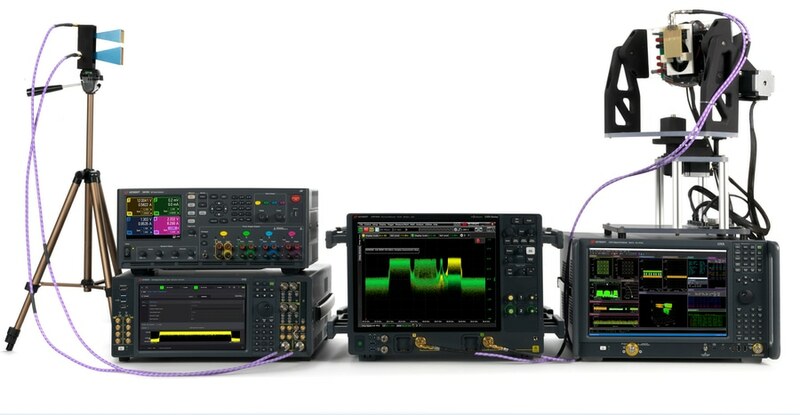 Keysight points out that the VXG Series is essentially a “one-box” approach that can replace multi-box solutions, thereby simplifying measurement setups and complex calibration routines. The company maintains that this approach will save time and reduce measurement errors associated with changing equipment configurations. Additional aspects of the VXG Series worth mentioning are automatic channel response correction and S-parameter de-embedding. 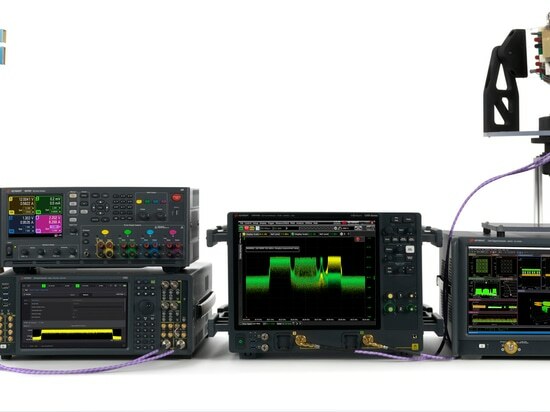 Lastly, embedded signal-generation applications powered by Keysight’s PathWave platform allow for simplified 5G waveform generation. The M9384B VXG microwave signal generator offers dual coherent channels.